6-1/4x3-1/2x1" 1/2 lb. 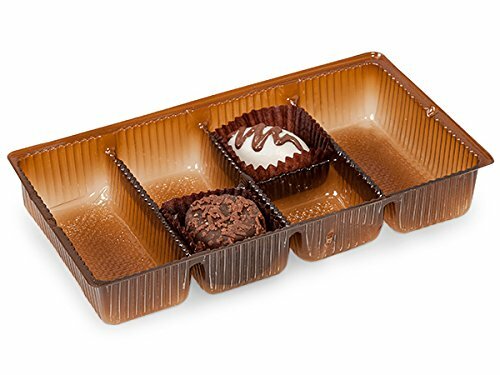 Medium Rectangle Chocolate Brown Candy Trays by the carton can be used with our candy cups and pads for easy, stackable layers in our candy and gourmet boxes. Fits our 1 lb. One-Piece Candy Boxes & 1/2 lb. Two-Piece Single Layer Candy Boxes. Trays have 6 sections. Complies with FDA regulations for food packaging. Candy Trays will give your candies an elegant presentation. They have separated compartments to keep candy and chocolates protected. Available in several sizes, and gold or chocolate colors, these trays fit many of our gourmet and candy boxes. Use our candy cups and padded liners to build layers. Complies with FDA regulations for food packaging.